I’ve long held this crazy theory that people who really love food lead ever-so-slightly happier lives than those who don’t. This theory comes from my own experience, mostly, and the observation that however bad I might feel, all I usually need is a bite or two of something tasty to feel myself again. I don’t mean to suggest that I don’t regularly get as down in the dumps as the next person, but when I do, it’s rare that these sentiments survive beyond mealtime; even the very worst of cases are nothing a freezer full of ice cream can’t resolve. By contrast, I can’t even imagine what it would be like to have my one true passion be something like, say, glacier climbing or comet watching, or for that matter any activity that is next to impossible to do on a regular basis; maybe I’m missing something here, but those poor folks must spend an awfully large percentage of their time miserable, don’t you think? That said, however, sometimes a food-focused life can seem pretty frustrating too. There is, for example, the agony that comes from striking up love affairs with foods I can only get ahold of once in a blue moon, or the endless battles against a metabolism that lags far behind the speed at which I can chew, or even the more abstract discontent that comes with having to earn a living rather than, well, dabbling in food all day. And then there’s the particular bane of all us food lovers who love to cook as well as eat: the fact that there are simply too many recipes out there to ever make in one lifetime. Honestly, between the tens of thousands of recipes I have in cookbooks, bookmarked online, clipped from magazines and newspapers over the years, scribbled on the backs of envelopes while daydreaming, and received with great fanfare from friends and relatives, I feel like even if I were able to spend every single minute of every day of my life cooking, I still wouldn’t manage to make a dent in the pile. While this is plenty frustrating in itself, of course, the icing on the proverbial cake is that even when I find a truly wonderful recipe – which is ostensibly the point of all this collecting, isn’t it? – it rarely stays in the rotation for long. I honestly don’t know how cookbook authors do it; you know how they’re always saying in recipe headnotes how this is one of their favorite things to eat and they’ve been making it religiously for thirty years and blah blah blah? Well I know I’m lucky if I can manage to make something twice before retiring the recipe to the graveyard better known as the "to make again" pile. In fact, if I manage to make something twice that already means it’s beaten the odds; some of my favorite things in the world (many things that appear on this site, even! ), I’ve only managed to make once. It’s not that there’s anything less than perfect about them – it’s just that there are too many other undiscovered masterpieces waiting in the wings to waste time on what I’ve already tasted. That said, when I tell you that today I’m giving you a recipe I’ve made at least a dozen times, I hope you understand how unusual that is. Admittedly, most of those occured in the first three or four weeks after discovering it, but please don’t think that reflects at all on the quality of the recipe itself. It dates to about five years ago, if my memory serves me correctly, to a summer I spent in Germany which defined itself (in retrospect, as these things always do) as our ‘farmer’s market summer’. You see, that was the summer I discovered Manuel had been keeping this very big secret from me, namely that his town was blessed with the most wonderful weekly market offering every variety of ripe, farm-grown product under the sun at ridiculously cheap prices, and all we had to do to partake was drag ourselves out of bed at a reasonable hour on Saturday mornings (well, I called the hour reasonable; he called it some things I can’t repeat on a family-friendly website). In any case, that was the summer I suddenly understood why everyone was always harping on about cooking seasonally, that it wasn’t just about supporting local farmers or reducing carbon footprints or anything like that, it was about how much better everything tastes when it’s in season. In fact, I think I had an epiphany to that very effect the first time I made this pasta, which I ran across one day in one of the few cookbooks then in my possession. It’s quite a simple dish, just some hot spaghetti tossed with mashed avocados, a couple of diced tomatoes and a sprinkle of crispy bacon; yet made with the ripest, candy-sweet tomatoes, buttery avocados and generous handfuls of spicy summer basil, its perfection defies description. Although we gorged ourselves on this pasta like it was going out of style, eventually the summer passed, the recipe was filed and, like every other once-favorite dish, it was forgotten, relegated to a text file on my computer in one of many overstuffed recipe folders. When I ran across it last week – I was looking for something else, mind you – at first all the memories from that farmer’s market summer came flooding back, but just as quickly my delight at having found it was replaced by frustration, and then a surge of self-deprecation for having being so fickle as to have not even thought about it in half a decade. Why is it, I asked myself disparagingly, that I am so driven to find the next great recipe that I can so easily forget about the ones I’ve already discovered? Is this how the rest of my life is going to unfold, in the senseless pursuit of things I will discard as soon as I possess them? But then I went into the kitchen, mashed up a bowl of avocados, put on a package of pasta to boil and chopped up some fat, dripping tomatoes. And after scraping my plate clean, I couldn’t quite remember what it was I’d been so worked up about. Who knows, maybe that theory of mine is not as crazy as it seems? This is one of those recipes that works best if you follow your instincts. Find the raw onions too overpowering? Leave them out. Have more tomatoes in your garden than you know what to do with? Stick a couple more in. You get the picture – just make sure, whatever you do, that you use only perfectly ripe, in-season ingredients. If you can’t (and I realize it’s not summer for everyone reading! ), do as James says in the recipe headnotes and "please choose another recipe". In a large serving bowl, mash the avocados, leaving a few chunks. Stir in the tomatoes, onion, garlic, vinegar and basil. Add salt and pepper to taste, being mindful of the fact that you’ll be topping it with salty bacon and cheese later. ine with the cold sauce, tossing to combine. Sprinkle with the bacon and cheese (or you can pass these separately if you wish) and serve immediately. dear melissa, the senseless pursuit of things one discards as soon as one possesses them…i couldn’t agree more with everything you’ve so eloquently put here! i do think it applies to everything from the need to compulsively buy yet more cookbooks to the lusting after gadgets one doesn’t really have the storage space for! irrational behaviour…but all things considered, it does make for a happier life 😉 i don’t think your theory’s crazy at all! Great summer recipe, Melissa! I won’t even try it here, however, as I cannot get good avocados, but next week in Scotland, hopefully..PS I’m definitely one of those people who happily re-use a recipe tens, if not hundreds of times. My Canadian apple cake, my spanakopita, penne alla vodka – all have been in my repertoire for years (and that apple cake for over a decade)..
Well said! I feel exactly the same. For 2007, I challenged myself to try a new recipe from one of my numerous cookbooks every week. It’s been fun but it means that I’m jumping from new dish to new dish more than ever. I might want to put a repertoire together. The pasta with avcado, tomatoes and bacon might become part of it, who knows! I loved this post. Everything you say, the life being better, the recipe flags piling up, the making things twice, everything, rings SO true.Once recipe I´ve made at least six or seven times is your banh mi, by the way. I had a student in one of my classes who announced one day that she never made a recipe more than once. She was trying to say that she tried new things every day, which is admirable, but she never moved beyond the written recipe. When you make something over and over, you develop confidence about your cooking — and she never felt confident, or competent, as a cook. I like to think I do both — work down my collection of bookmarked recipes and, when I find one I really like, make it over and over. Interesting post. I know some people, who have many, many doubts about all kind of food. They don´t enjoy eating at all. "You can´t eat this, because it´s fattening .. you can´t eat that, because then you will get poisened …" they say.Those people are more often put on the sick-list than others. How lovely! I’ve done this sans the avacado…but love the thought of the creamy buttery flavor that would lend. Very true about the people who enjoy food, they are a different breed, and seemingly much happier. I find it interesting you lament about your recipe graveyard. I’ve never thought of my ever growing pile as such, but considering I’m a cook that doesn’t much use recipes I would suppose it would be a graveyard. I think though that the graveyard is more of a resource to sharpen my concepts of food combination. I can read a recipe book like a great novel…cover to cover. My best cooking times are purely creative, of the "what can I throw togeter in my pantry and have be fabulous" ilk. I completely agree with your theory- people who love food fill each day with a variety of sensory experiences, exploring and appreciating different tastes textures, learning about different cultures, and appreciating nature and the season’s bounty.I actually consider the fact that I don’t work full-time in food a blessing. It allows cooking to be a place of respite for me, not something to be complicated by the stresses of work or deadlines or money, etc.I am recently, only very slowly, coming to appreciate avocados, and I have plenty of tomatoes growing in my pots, so I’ll have to put this on my list. This comes to me at avery handy time-I’ve these gorgeous ripe Haas avocados from Costco- which, if you don’t live in avocadoland is the very BEST place to get perfect avocados in the USA, totally consistently. Plus, I have a whole bunch of very ripe, need to use immediately farmbox tomatoes.This is for tonight., and thank you.I have found that writing a food blog is a force keeping me from my old habits of making favorite recipes over and over again. I find I want to find new things, in order to write about them, And in my case, that’s probably mostly to the good- what with my tendencies in the other direction.But I do think it is worthwhile to have a few favorite repetoire classics, that are so good, and that you could make in your sleep. If an occasion comes up, and I am not feeling creative, I can just get through it more or less on automatic. And then there are the familiar comfort foods..so nice if you are ill, or feeling out of sorts.I’m looking forward to trying this one. I often make something along these lines. lovely pic, btw! totally bizarre combo! i must try this! Great photo! This recipe exudes freshness! Cheers! Well, this is a timely subject! I was JUST going through my recipe binders this morning (yes, I have binders and binders of recipes) and wondering why I have not repeated many of the dishes we loved so much. I think there needs to be a fine balance of venturing out into the unknown of new recipes, and returning to the comfort of old, and perhaps even the meshing of both into new traditions.All that to say, the "new" recipe you posted for us today might just become of of my "old" favourites fast! Your photo is simply lovely. too many recipes, not enough time to cook ’em all… I hear you.I’m travelling travelling travelling around the world, collecting new savours and lots of recipes along the way. Do I have a kitchen? No I do not. When next I have a chopping board of my own, the backlog will be truly terrifying. Nonetheless, whensoever my return to the kitchen should take place, I will try this recipe as it challenges one of my long held principles, namely that avocadoes should be kept far away from anything hot, or even warm. PS It was excellent, and I will be making it again-next time for other people-even though it is a last minute dish, it is so simple to do that it is perfect for company-it will be completely panic and snag-free. sounds like a great recipe… however unfortunately, ripe avocados and ripe tomatos do not coincide with one another where I live. Tomatos are a summer crop, and avocados are more of a fall-winter crop here in Israel. I’ll see what can be done. hmmmm…Come to think of it, I may leave the avocado in large dice rather than mash it. Grazie mille for this delicious recipe! It was a complete joy making and eating this dish. Today was just one of those days… then I lit up after tasting this. Thank you. Fabulous blog, Melissa. I have a friend with a similar "pile" as his cruel mistress… though his pile is ceiling high with movies, new and old tv shows and such… (to each their leisure…) I think you’re much luckier than he… more variety and more to enjoy while fresh!I love all the ingredients in this recipe and would have never thought to put avacados in pasta. I love to eat seasonally… and if the produce stand permits, I’ll be making this as soon as possible – 12 times, wow… this comes highly recommended! 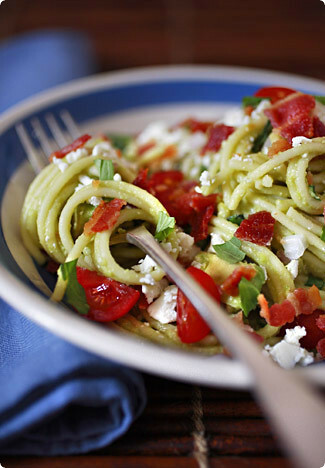 I wouldn’t think to put avocados in a pasta dish, but the recipe has me rethinking that… looks divine! I tried this yesterday for my birthday lunch — wonderful! I too would have never thought to put avocado in a pasta dish (in fact my companion said AVOCADO??) but it melted into a buttery delicious-ness that we enjoyed thoroughly. I read your posts all the time and this was the first recipe I tried (but certainly not the last!). Thank you! I made this last night and it was comforting, exactly what the end of the day called for. More than the quality of the finished dish, though, I was distracted by the enourmous effort you must put into each photo shoot. My pasta dish looked only vaguely similar to what you have shown (unfortunately, the avocado browns quite quickly). In an instant, my admiration for the quality of the art on this site grew exponentially. Really, well done!